Or if you don’t trust links in blogs like this (I get it) go to Twitter.com and change it from there. And then come back and read the rest of this. We’ll wait. “When you set a password for your Twitter account, we use technology that masks it so no one at the company can see it. We recently identified a bug that stored passwords unmasked in an internal log. We have fixed the bug, and our investigation shows no indication of breach or misuse by anyone. A message posted this afternoon (and still present as a pop-up) warns all users to change their passwords. 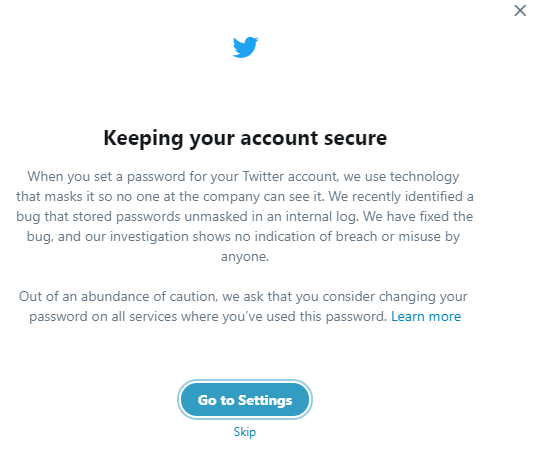 Agrawal explains that Twitter normally masks user passwords through a state-of-the-art encryption technology called “bcrypt,” which replaces the user’s password with a random set of numbers and letters that are stored in Twitter’s system. “This allows our systems to validate your account credentials without revealing your password,” said Agrawal, who says the technology they’re using to mask user passwords is the industry standard. 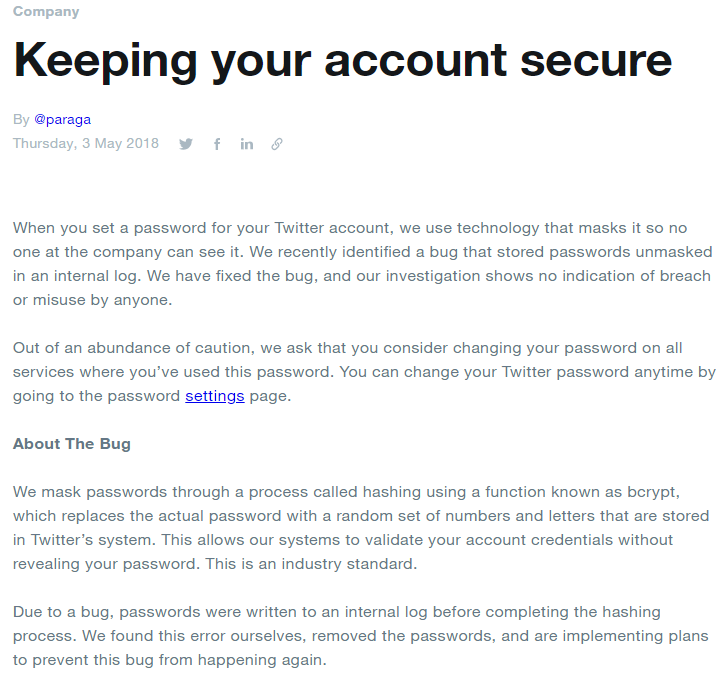 Agrawal wrote that while Twitter has no reason to believe password information ever left Twitter’s systems or was misused by anyone, the company is still urging all Twitter users to reset their passwords NOW. -Change your password on Twitter and on any other service where you may have used the same password. -Use a strong password that you don’t reuse on other websites. -Enable login verification, also known as two factor authentication. This is the single best action you can take to increase your account security. -Use a password manager to make sure you’re using strong, unique passwords everywhere. This may be much ado about nothing disclosed out of an abundance of caution, or further investigation may reveal different findings. It doesn’t matter for right now: If you’re a Twitter user and if you didn’t take my advice to go change your password yet, go do it now! That is, if you can. 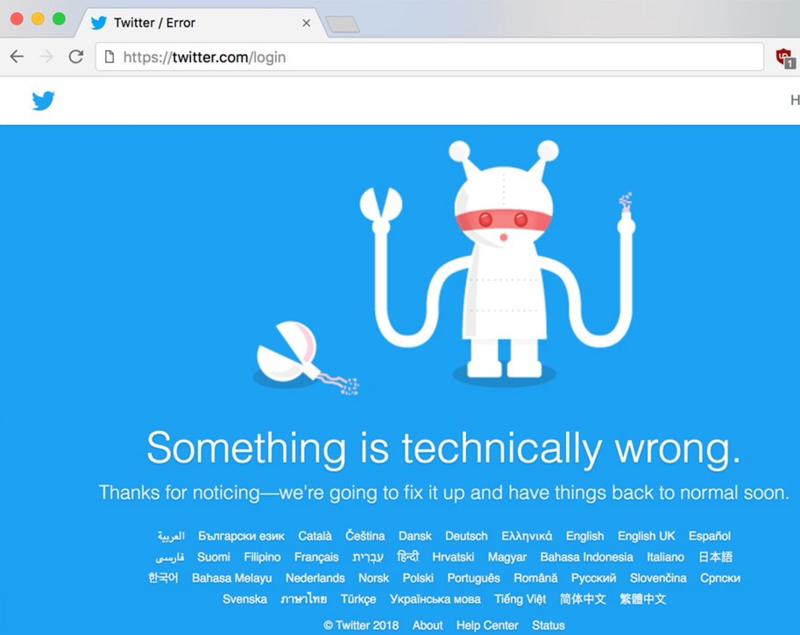 What KrebsOnSecurity and other Twitter users got when we tried to visit twitter.com and the Twitter CTO’s profile page late in the afternoon ET on May 3, 2018. If for some reason you can’t reach Twitter.com, try again soon. Put it on your to-do list or calendar for an hour from now. Seriously, do it now or very soon. And please don’t use a password that you have used for any other account you use online, either in the past or in the present. A non-comprehensive list (note to self) of some password tips are here. I have sent some more specific questions about this incident in to Twitter. More updates as available.